One might be quick to say that an mp3, mp4, or mp79, or some other digital music file, is the equivalent of an old-time audio cassette (“tape”), or compact disc (“CD”). And one would be wrong, because the computer file lacks something that tapes and CDs always had—and not just a $17 price tag, or price tag at all. A purchaser of tapes or CDs got something other than two good songs, maybe one halfway decent song, and a bunch of drek. Tapes and CDs came with liner notes, and liner notes made the price tag totally worth it. Liner notes were glossy booklets that contained notes about the artists and the production of the album, photographs of the artists performing live and smoking cigarettes, and sometimes the lyrics to the songs. Knowing all of the words to a song was like knowing a secret incantation, that when said would release the demons that gave the band members their talent and ability to play with sweaty strings of hair in their faces. I was never more impressed than when I saw a good friend sing along perfectly to “Back off B*tch [Explicit]” off of Use Your Illusion: Disc 1 from Guns ‘n’ Roses. He must have studied the liner notes for hours to catch each nuance of the piece. But what I remember the most about liner notes—more than the lyrics, more than the photographs, more than the artwork, more than even the music itself—was the smell. That clean, sterile, plasticky, glossy smell that told my twelve-year-old brain that good times lay ahead. That smell would hit me the moment I pried open the jewel case, even though I never knew why it was called a jewel case, and that it certainly did not contain any jewels, unless you bought a CD by the artist known as Jewel, which I never did, and even if I did would never admit. Even now, years after I had to throw out all my jewel cases in the Great Scolding of 2005, I can close my eyes and imagine the smell of liner notes. One time a friend caught me smelling the liner notes of one of his CDs. He had gotten up to go to the bathroom and I thought he was going to be gone longer than he was. When he returned I had my snout in the middle of the booklet to his copy of Metallica’s black album, which we just called Metallica Metallica. As my nose became accustomed to the smell, my eyes would drink in the images. And drinking is an apt metaphor. Because no matter how many assemblies they made sit through in school, where adults used every approach short of mass hypnosis to persuade us that drinking and doing drugs was not cool, the photographs and original artwork of the liner notes told a different story. The other day I was my parents’ home, cleaning out that week’s “mystery box from high school,” when I came across my collection of liner notes, stripped of their jewel cases but otherwise in perfect working order. I removed the hardened rubber band and flipped through the liner notes one by one, stopping every now and again to explore a particular booklet, and all the while breathing in the essence of ‘80s, ‘90s, and today. And I rolled around on the floor, reliving the magic, my mother walked in and said, “Did you know that the original liner notes came with records.” She paused and smiled. “Remember those? Thanks to Patrick Champ for the topic. Remember When Life Wasn’t Consumed by Facebook? Have you ever been working really hard on something, and have someone who sees you working say to you at the peak of your frenzy, “You know, no one ever said on their death-bed that they wished they spent more time at work”? That may be true, but will anyone ever say on their death-bed, “I wish I had spent more time on Facebook”? The recursion is maddening. I’m not sure if recursion is the correct word to use, but the point is I can’t retrace my steps. I get disgusted with myself and sign off Facebook in a huff. And then two minutes later I realized that I forgot to do on Facebook what I had initially meant to do. 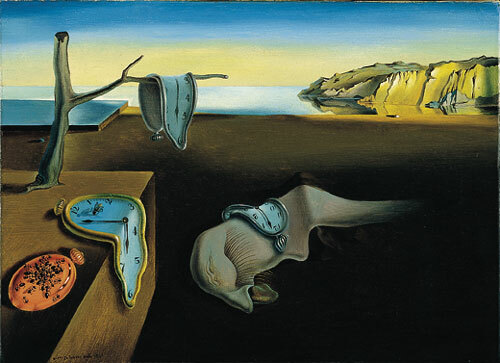 So I sign back on, and the cycle of wasted time and self-disgust begins anew. I’ve heard reports that the average Facebook user spends six hours a day on Facebook. If you could put time in a bottle, how many bottles would that be, worldwide? Does it make a difference if you use plastic bottles? It certainly does if you’re an environmentalist. But most non-environmentalists only care that the bottle not contain any BPA, whatever that is. Six hours a day for every person on Facebook. This cannot be as disheartening as it sounds. Perhaps many Facebook users live in places where there is not that much to do, and going on Facebook actually increases the productivity of their regional economy. But for most people, I imagine, Facebook is taking time that could be put to far more productive use, like helping in the community, spending time with family, or writing a blog. Maybe companies will figure out a way to have employees do their work on Facebook. I’ve alluded before to the possibility of suing people on Facebook. Perhaps meetings and projects could be done with fan pages. Products could be ordered and memos sent. Even those little office birthday parties…well, we know Facebook has got the birthday thing down. But what would those people who work on Facebook do to waste time? They could not very well waste time on Facebook, because Facebook would be their job. By definition, you can’t waste time at work by working. The Facebook workers would have to sign off, and turn off the monitor or shut the laptop, and pick up a stack of paper, and start filing. And at 5 o’clock, the Facebook workers would put on their coats and hats, and go to a cafe, where they would meet real people, and talk face to face. They would sip their coffee and nod, and smile, and make all of the tones and gestures that give spoken language its vitality. And after they drain their cups, and catch-up on each others’ lives, these Facebook workers would sit back and reminisce about the days when people socialized over Facebook. Do you stick to the grocery list when shopping at Facebook? Or do you find yourself wandering the aisles as time ceases to exist? Remember When You Had Never Heard of a Debt Ceiling? Two days ago, when I started procrastinating over writing this post, it seemed like everywhere I turned I was hearing about the United States’ debt ceiling, and whether Congress would raise it or subject the country to a lot of letters from collection agents. For weeks now I’ve been picturing the Representatives and Senators walking around stooped, the ceiling of the Capitol Building pressing down on them like that Floor 7 ½ in Being John Malkovich. I do not know any stories about the debt ceiling. But I do know a story about a ceiling. When I was around ten years old, slime was a popular toy. Not the kind of slime you find on week-old turkey cold cuts, or the kind that rained on anyone who said “I don’t know” on You Can’t Do That On Television, but the kind that was pliable and sticky for maximum destruction. The slime would stick to any solid matter it touched. One morning my mother came downstairs to see me cutting clumps of my own hair out after a particularly educational experiement with the slime’s adhesiveness. Another time the slime led to a hasty farewell to our family’s cherished VCR. But the most memorable experience was how my brother discovered the slime’s aerial properties. My brother and I took an annual trip to Florida to see our paternal grandparents. They lived near Fort Lauderdale in a senior community that had a swimming pool and a lot of women named Rose. Of course we loved our grandparents and savored every game of Po-Ke-No and story about the Great Depression. But the best thing about spending a week with grandma and grandpa was that we went out for ice cream every night. In that year of the slime, my brother brought a specimen onto the plane. Had he done that today I am sure the full body scans would have detected the item, and my eight-year-old brother would have been interrogated for hours in a small room. But in those days the only thing the airlines cared about was that we not kick the seat in front of us. My grandparents’ house, like most houses in Florida, had a ceiling. I never noticed it that much until my brother tossed his smuggled slime up in the air hard, so it stuck to the pebbled white ceiling. We could not reach it, even after stacking the hassocks atop one another, and our 78-year-old grandfather had to get up on a ladder and pry the slime off. He was not pleased, and asked that my brother not do again. Not two hours later, the slime was again stuck on the ceiling. My brother was fully engaged in brinksmanship. Again our grandfather had get on the ladder, again he had to pry the slime off his white ceiling that now had two greenish stains, and again he scolded my brother. “If you throw that slime on the ceiling again,” he said, “we’re not taking you out for ice cream for the rest of the week.” From his face we knew this threat was serious. My brother loved ice cream even more than mischief, and to even hint that the nightly ritual could be compromised was like threatening to remove one his limbs. So he was good for the rest of our time there. Mostly good. He still splashed the wrinkled octagenarians at the community pool with his cannonballs in defiance of the large sign that said, “No Cannonballs.” And he still gave my grandmother a near-coronary by getting a little too friendly with the neighborhood lizards. But the green slime from Long Island remained in its clear plastic egg, and we got our ice cream every night during that vacation. “On delivery day, I could see the books in front of every home. But the homeowners, for some reason, were not always that anxious to adopt the books, and often left them out there for a day or two. I smelled opportunity, and one year I went out and stole every copy of the telephone book that had been delivered in our neighborhood. “Under cover of night I went door to door, grabbing the yellow tome before the homeowner awoke or dog started barking. It was tedious work. I could not carry more than two or three under each arm, and so had to make frequent trips back to my house. 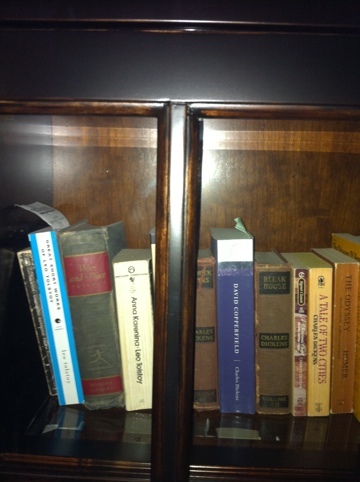 I stored the telephone books in my closet, and when I was done there was not much room for my clothes. 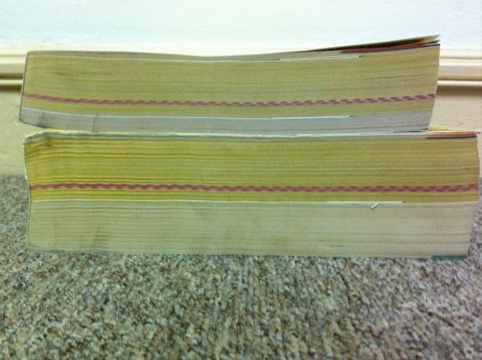 “I remember exactly how the telephone books looked in my closet. Five-foot stacks that shoved my pants and shirts aside. The pristine spines glowed like bars of gold with advertisements for personal injury lawyers. I thought about the thousands of names and addresses and telephone numbers of people I would never know. I thought about all of the pizzerias and locksmiths and hardware stores and roofers and orthodontists that were nestled in next to my old sneakers and a stop sign I stole over spring break. I thought about all of the trees that had been cut down to make these telephone books, and that by stealing them I was saving the trees, in a way. “But what I did not think about was how I was going to keep these stacks of books a secret during a time when I still lived with my parents and did not do my own laundry. I guess I should have thought about that. “I would later tell my mother, upon questioning, that I did not know why I stole the telephone books. Grown-ups always got annoyed when kids said they did not know why they did something bad. But in my case it was true; I really did not know. It just seemed like the thing to do. The phone books were free of charge, in the open, not nailed down, and easy to spot in the dark. In the summer, when there was nothing to do, this was something to do that did not entail hopping fences. Had my friend continued I’m sure he would have concluded his tale by saying that he learned a valuable lesson; that no amount of midnight mischief is worth depriving one’s neighbors of their means of communication. But at that moment his cell phone rang. He picked it up and said, “Hello?…Really? The Verizon guy just left the modem sitting on their stoop?…I’ll be right there,” and then left, pleading a prior engagement. Remember When We Didn’t Have Piles of Chargers and Power Cords? When I was a kid there was a power outlet next to my bed. I had no need for power strips or outlet multipliers because I only had two devices to plug in: my alarm clock, and a reading lamp that I used to heat up the thermometer whenever I wanted to play sick, just like Elliot did when he wanted to stay home with E.T. Today, I can’t take two steps in my house without stepping on a power charger or cord. A charger for my Kindle, a charger for my laptop, a charger for my digital camera, a charger for my old digital camera (a Canon ELPH that cost me $500 in 2002 and which now gets the cold shoulder from every current operating system), a charger for the portable external hard drive, a charger for the electrical drill I’m forced to use whenever a blind needs hanging or a neighbor needs a root canal, a charger for the digital camcorder, a charger for the digital speakers, a charger for the steam mop, a charger of unknown chargee—so far behind the buffet that reaching it is not worth the health insurance deductible—and, last but by no means least, a charger of the purest white for my beloved iPhone. These chargers and power cords congregate in a giant knot by the outlet. My wife dislikes these piles and is always trying to find ways to hide them. She pointed to the pile of black wires. If the scene had been out of a movie I probably would have chuckled and then mentally scolded the owner of the house for creating a fire hazard. But I was not in a movie and I didn’t chuckle. This was my life and it wasn’t funny. I explained that we couldn’t just move the wires because they were hooked up to things that could not be moved. I told her that the only way that would be possible would be to put something in front of it the entire time, because to move the wires was not reasonably practicable. That would end the discussion. And that’s how I found myself standing in one spot for hours on end, like one of the guards at Buckingham Palace, except instead of a busby on my head there was a bowl of Tostitos in my arms, containing at its center a smaller bowl filled with salsa. Our guests come by me and dip some chips. I was amused at how often they succumbed to the pressure to talk to me. Most of them I did not know me that well, and struggled with the awkwardness. A few gave up. Then there was the time that I tried to unplug my cell phone and ended up unplugging the Tivo, ruining my wife’s taping of The Real Housewives of New Jersey. “That’s my favorite one,” she said. “I can’t believe I’m going to miss it now.” I suggested she put an ad on Craig’s List for someone who taped that episode. Eventually, the cords and chargers end up in a closet or in the basement. Deep down I know that the exiled cords and chargers will never be used again, but I am too scared to throw any one of them out. To throw out the charger is to throw out the device itself. I spend at least 12 hours a week untangling the wires for all of the power cords in the living room. There must be a way to monetize that skill. People should want to line up and pay $5 a head to watch me untangle power cords and cell phone chargers. I suppose, though, that I should not complain about the mess of chargers when the devices do so much. Instant communication, instant information, instant access, instant video, instant gratification—a small unsightly pile of tangled black plastic wires and domestic strife is a small price to pay for such wonders. 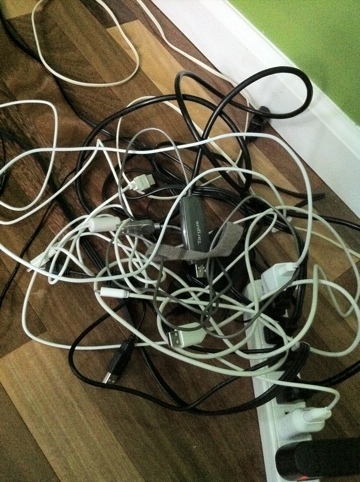 Do you have a knotty pile of cords and chargers in your home? How do you cope? 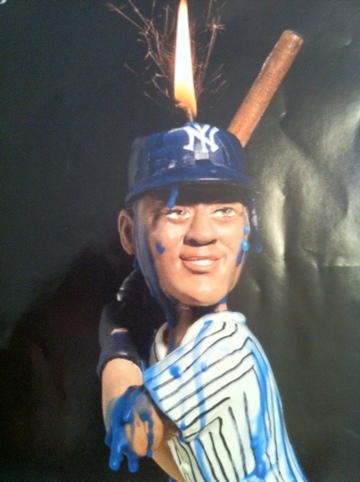 The cover of the June 26th issue of the New York Times Magazine featured a candle that looked just like Yankees’ shortstop Derek Jeter, holding a bat as if waiting for the next pitch from, perhaps, a candle that looked like Tim Wakefield. The Jeter candle was lit, and navy blue rivulets of melting wax ran from the hat down the pin-striped uniform into the butter cream frosting. The story, titled “For Derek Jeter, on His 37th Birthday,” was about how the Yankees’ captain, who turned 37 on June 26, has been in a type of hitting slump known as “aging.” The fancy scientific reason the beloved Yankees’ captain has not been as productive behind the bat, whether made of ash or candle wax, is because of age-related degradation in his fast-twitch muscles. Jeter now, apparently, requires a full half-second to decide whether to swing at a 90 m.p.h. pitch, rather than the mere quarter-second required in his 20s and early 30s. I wonder how my fast-twitch muscles are faring these days. I notice that I am not squashing bugs as quickly as I used to. When driving, I do not swerve around roadkill as deftly as I once did. And it now takes me a full two seconds to change the channel whenever that annoying commercial for Progressive Insurance with Flo comes on, whereas I used to change it almost instantaneously. I remember when my parents turned 37. I noticed that my father was taking a few extra seconds to pull the car over to the side of the road to yell at me for tormenting my brother with the business end of a seat belt. And when I went to the supermarket with my mother, I could swap the Cheerios with Fruity Pebbles before she could turn her head. I felt bad taking advantage of my parents’ aging, but Mariano Rivera would have done the same thing. All around me I see evidence of age-related degradation of fast-twitch muscles. Insurance adjusters taking a few minutes longer to reject my claim. Cops taking a few extra seconds to flip on their lights when I go flying by them at roughly the same speed as a major league pitch. Even the worker at the deli I frequent—he couldn’t have been a day over 32—did not react quickly enough to my direction of no onions when making my sandwich, leaving me to pick them out myself. When I was younger I was always very fast at tying my shoes. If I was inside watching television and heard, say, the ice cream man coming down the block, I would have my sneakers on and tied inside of 15 seconds, faster than it took my mother to say that I wasn’t getting any ice cream until I scraped the Silly Putty off the ceiling. Just the other day I was lying in bed and heard the sound of the garbage truck coming down the block, and I realized, with a panic, that I’d forgotten to put out the paper garbage. Naturally terrified at the prospect of going another two weeks with a mountain of Penny Savers and empty boxes of Count Chocula overflowing the blue bin in my garage, I leaped out of bed and ran downstairs. I didn’t care if my hair was sticking out in several different directions, and I didn’t care if my neighbors saw me in my Spider Man pajama pants. But I didn’t dare go barefoot; that’s a good way to get a splinter. So to Derek Jeter, I say: Happy birthday, hope you get your 3,000th hit, and invest in some Velcro cleats. Have you noticed any degradation in your fast-twitch muscles or in the fast-twitch muscles of the people around you?